The Trans-Pacific Partnership (TPP) is revving up for a vote in the “lame duck” session of Congress that follows the election, and the Rock Against the TPP Concert Tour is drawing large crowds. Awareness of TPP drives opposition, and Rock Against the TPP is doing its part to drive awareness. A July survey by Democracy Corps shows that Americans are generally unaware of TPP, but when they learn about it, a majority is opposed to it. While people initially think of “trade” in a generally positive way, the more people learn about TPP and other “trade agreements” the more they shift to opposing them. After hearing a balanced debate – including overall statements and specific arguments in support and in opposition to TPP – voters become dramatically less positive about the value of past trade agreements and much more pessimistic about TPP. Voters move from believing past trade deals are positive by 15 points to parity with those believing they are a bad thing, and voters shift from parity in the argument over TPP to two-thirds opposing it. Most importantly, 61 percent of voters are now eager to hold a Member of Congress accountable should he or she vote to pass the TPP when it is taken up. Summary: Before hearing arguments both in favor and against TPP a majority favors it. But after hearing both sides, 2/3 oppose TPP so much that they say they will hold members of Congress accountable. 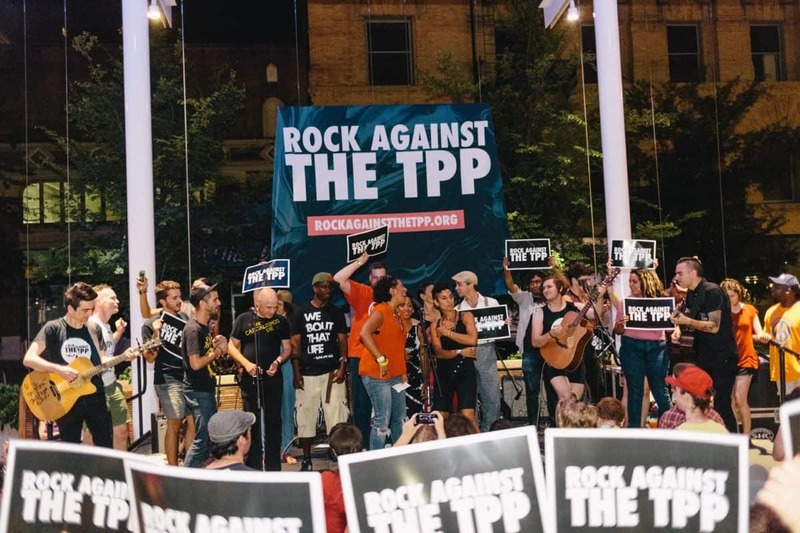 So to help drive public awareness of TPP, there is a Rock Against the TPP concert tour underway — and it is drawing large crowds. The tour features celebrities including actress Evangeline Lilly, hip hop icon Talib Kweli, comedian Hari Kondabolu, and punk band Anti-Flag. TV’s Adult Swim comedian Eric Andre made a surprise appearance at the Seattle event at Showbox SoDo. Rock Against the TPP is organized by legendary guitarist Tom Morello (Prophets of Rage, Rage Against the Machine, Audioslave), his new label, Firebrand Records and digital rights group Fight for the Future, the tour is sponsored by Backbone Campaign, Citizens Trade Campaign, Communications Workers of America (CWA), CREDO, Demand Progress, Friends of the Earth, the International Labor Rights Forum, Public Citizen, Sierra Club, SumOfUs, the Teamsters, United Steelworkers. The Northwest events were organized with support from the Washington Fair Trade Coalition and Oregon Fair Trade Campaign. Next up is San Francisco, September 9th at Regency Ballroom, with an event featuring punk legend Jello Biafra (Dead Kennedys), Grammy winning latin alternative band La Santa Cecilia, and riot-grrrl cello legend Bonfire Madigan. Additional tour dates are to be announced.